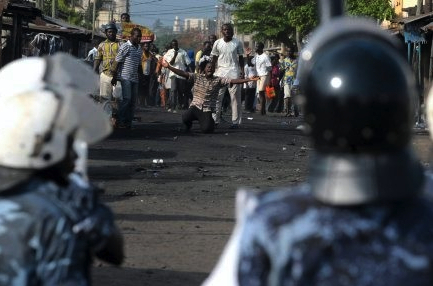 Protesters and police face off in Lome. The headlines from Lomé, Togo are tension inducing. For Togolese or those with family there, it must be excruciating. It appears that President and dictator’s son Fauré Gnassingbé has been elected with government reporting 1,243,044 versus 692,584 votes for nearest rival Jean-Pierre Fabre of the UFC. Official turnout was 2,119,829 (~%64), so the 5 opposition parties netted only 877,785. Meanwhile ECOWAS has praised the vote, mostly thanks to Faure Gnassingbé backer and President of Burkina Faso, Blaise Compaoré. The EU, which had 200 observers, claims to have no evidence of vote fraud. But they do note that in the north, Gnassingbé’s father’s region, Fuare’s people were passing out gifts, including quarter price rice. Other reports counted a 16 to 1 number of RPT posters in Lome, an opposition strong hold. UFC charges that their voters feared a repeat of 2005, where the army literally hunted down and killed those suspected of supporting the opposition. This is likely true, but neither of these tactics change the vote numbers. The RPT has used everything available to buy and bully the vote, and they have succeeded. ECOWAS or EU failure to factor in this is criminal. The EU even helped to create a special Togolese paramilitary police unit (the FOSEP) to “protect” the vote. This despite the long suspicion that Gnassingbé the younger is a puppet of elements within the security forces. I’m sure some stirring EU powerpoint presentations were provided, but that hardly changes the balance of forces. The fact is, postcolonial rulers have gotten very good at fixing ‘free’ elections in Africa, passing the muster of democracy in a proforma fashion, while retaining real power. When the opposition makes a stick, this can pass quickly, or create instability which can fester for decades. Will this end like Gabon? Or Niger? Or — God help us — Cote d’Ivoire. To see results from the ground check out togoelection2010.com. It uses the Ushahidi platform, developed a a sms reporting hub during the 2007 Kenya violence. The French government is one of the few that has as yet not recognized Faure as winner. They took a bit of wait on Ali Bongo’s 2009 contested win in Gabon. That election is the best parallel – so far – to what is happening in Togo. 5- Brigitte Kafui Adjamagbo Johnson : Convention démocratique des peuples africains, the only woman in the race (13 451 votes). South Africa’s News 24 warns: “Togo opposition protest looms”.